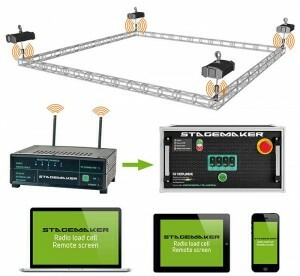 Stagemaker load cells are extremely reliable. Cable-free, they offer several working frequencies to ensure the greatest possible transmission dependability. Individual load cells transmit measurements in such a way as the failure of any one device cannot interfere with the weighing unit as a whole. Furthermore, they are fitted with long life batteries (5,000 to 10,000 hour) offering more than a year's uninterrupted service even though, for safety reasons, there is no standby mode. The load cells' information receiver is fitted with an inverter ensuring continuity of service even in the event of a power cut. To facilitate installation, load cells require no special tools or accessories to mount them on motors. They can remain mounted on any given hoist throughout a performance tour and do not have to be mounted or dismounted for each installation at a new site. In the SRLI version (Stagemaker Radio Load Cell Integrated), load cells are delivered already installed on the hoist chain. 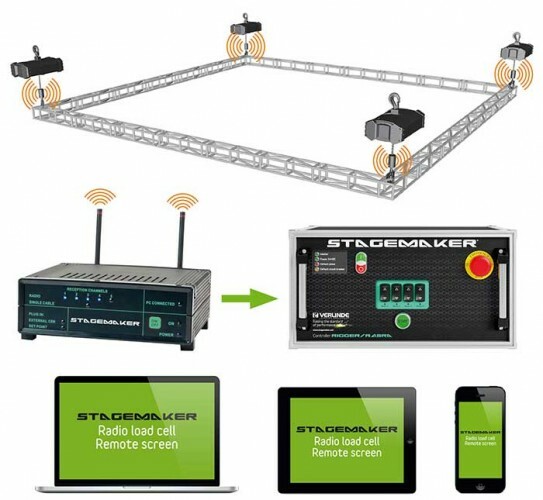 The Stagemaker radio load measurement system is compatible and interactive with the Stagemaker verification process: in the event of overload, the controller automatically halts the movements of all motors on the grid. Many options are available. For instance, further radio frequencies can be added. If that is the case, the system switches from one to another every second, irrespective of the number of frequencies. So, if one frequency is subjected to interference, another will be available thus totally eliminating any risk of non-reception. For installations with numerous hoists, slave/master radio receivers are also offered for robust weight indicators for tough environments and a system of overload alert by SMS.